Thanks to Shelby Farms Park Alliance, Don Richardson had a green wristband with him in San Francisco to present to New York Times columnist Thomas Friedman on behalf of our collective Greening Greater Memphis movement. Freidman writes extensively about environmental issues and was at the recent Sierra Club meeting in San Francisco to receive the 2007 David R. Brower Award, which "recognizes a professional journalist whose work has made a significant difference in the actions of government at the local, state or national level pertaining to the environment." 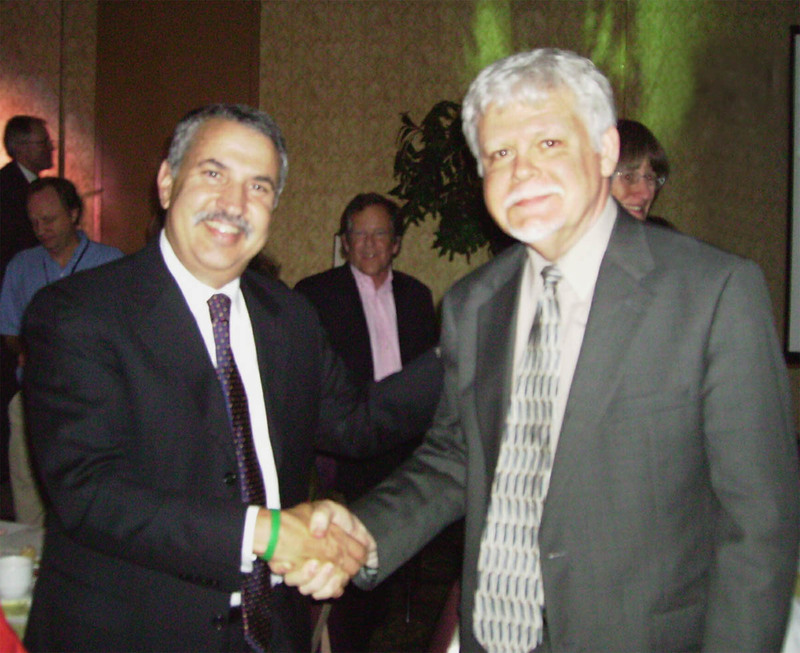 Immediately after the banquet, Don had a chance to tell Friedman that in Memphis we have updated his famous phrase, "Green is the new red, white and blue" to reflect our grassroots outreach and to "award" Freidman a wristband for making being green very hip. Friedman was ecstatic in his appreciation, creating a minor stir by jumping up and saying, "I love it, I can't wait to put it on." Jeremy Doochin of Nashville, captured the moment for all of us to enjoy. National Sierra Club Executive Director Carl Pope is seen in the middle background stepping off the podium wondering about all the excitement.